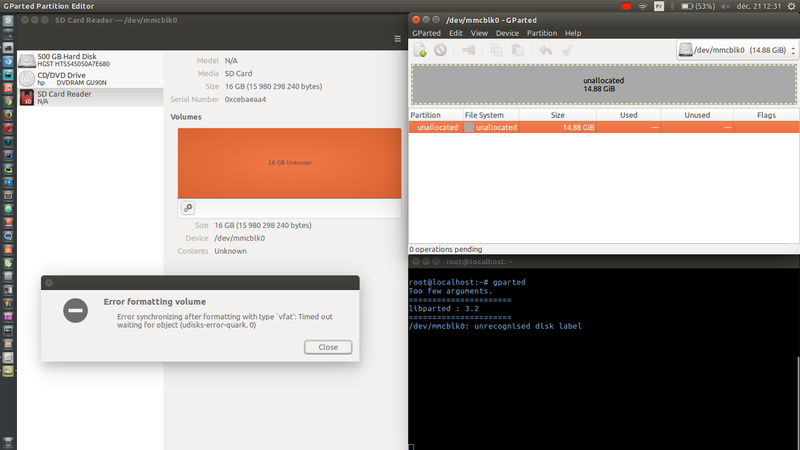 Device -> New Partition Table. filesystem has 2 32-bit FATs and 16 sectors per cluster. FAT size is 15226 sectors, and provides 1948814 clusters. Volume ID is 4d768915, no volume label. I'm not concerned about the data in it, i just want know how can i fix it. the device is recognized as a mass storage device. Such a device works best, when there is at least one partition. But you tried to create a file system directly on the device (without a partition structure) like it used to be on floppy disks, and like is is in CD/DVD disks. You can create a partition table with manual tools, for example gparted, but it is 'automatic' with mkusb. When gparted does not work, I suspect that there are some data, that confuses gparted, and mkusb overwrites those data with zeros (overwrites the first megabyte). Not the answer you're looking for? Browse other questions tagged partitioning mount hard-drive data-recovery gparted or ask your own question.